Blog post Title. ISme SABSE JARURI HOTA HAI TITAL. 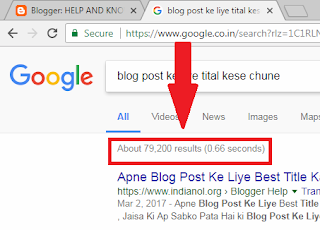 90% LOG AAPKE BLOG POST KE TITAL KO PADH KAR HI AAPKE POST KO KHOLTE HAI. ESE MAIN BAHUT JARURI HOTA HAI KI HUM APNE BLOG KE POST KA TITAL KESA RAKHE. AAPKO YE JANKAR THODA SHOK LAGEGA. KI BLOG KE POST KE TITAL KE HISSAB SE HI HMARI GOOGLE MAIN RANKING HOTI HAI. HMARE BLOG KE POST SE MILTE JULTE KITNE POST HAI YE BHI HUME PATA LAGTA HAI. ESLIYE AGAR TITAL MAIN EK WORD BHI GALT HOTA HAI TO HAMARA BLOG POST NICHE KHI PADA DAB JATA HAI FIR USE KOI NH PADHTA. BLOG POST KA TITAL CHOOSE KRNE KE LIYE. SABSE PAHLE DEKHE KI JIS TOPIC PAR HUM POST LIKH RAHE HAI USKA COMPITION KITNA HAI. AGAR AAP KAM COMPITION WALE TOPIC PAR POST LIKHOGE TO VIEWS BHI JAYDA AAYEGE. AUR AAPKE INCOME BHI JAYDA HOGI. AB APNE TITAL KO ALAG ALAG TARH SE LIKH KE DEKHE. AAPKO BAS APNE TITAL KO ALAG ALAG TARH SE LIKH KAR SEARCH KARNA HAI. JIS BHI TITAL PAR KAM COMPITION HO USE APNE POST KE TITAL KE LIYE SELECT KAR LENA HAI. AAPNE UPAR PHOTOS MAIN DEKHA KI EK “KESE” KA ISTMAAL KRNE SE COMPITION 50% KAM HO GAYA. ESLIYE BLOG POST TITAL KO CHUNNE SE PAHLE JAAN LE. KI KIS TARH SE AAP EK ACHA POST KO RANK MAIN LANE WALA TITAL CHOOSE KAR SAKTE HAI.